South Coast Glass is a family owned and operated company that has been employing local people for more then 30 years. We started out as the areas main supplier of domestic windows, usually producing up to thirty house-lots of windows a week. We have made a gradual change over the last eight years into the specialised niche of architectural and commercial windows. We offer service to the local area, the Sydney metropolitan area, the central coast, the far South Coast and the Highlands. 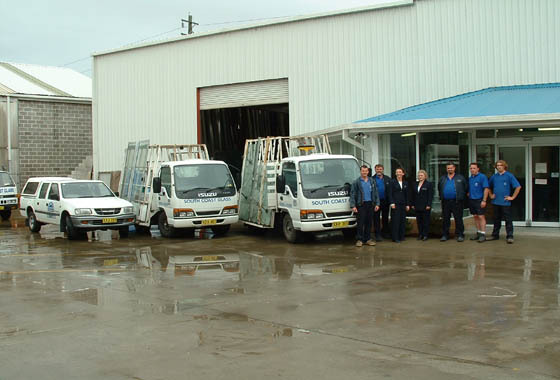 We are members of the NSW Glass and Glazing Association and our team of qualified glaziers has over 100 years combined experience in the glazing and construction industries. South Coast Glass offers a complete manufacturing service using quality hardware and where possible, Australian made components with heavy duty framing suites that give optimum performance for long term durability and problem free use. Over the years we have completed a wide range of projects which can be viewed at our completed projects page. We handle all aspects of the commercial and architectural window industry, with distinctive and unique glazing work our specialty. We have the expertise to carry out all types of work with the highest standards of workmanship. Complimentary to our window services, we are also the supplier of the revolutionary Easy-Track curtain track system. For more information on this innovative product see the Easy-Track page.